Plumbago auriculata (common names blue plumbago, Cape plumbago or Cape leadwort), syn. P. capensis, is a species of flowering plant in the family Plumbaginaceae, native to South Africa. It is an evergreen shrub, often grown as a climber, ascending rapidly to 6 m tall by 3 m wide in nature, though much smaller when cultivated as a houseplant. It has light blue to blue flowers and also variations with white (P. auriculata var. alba) or deep blue -shown here (P. auriculata 'Royal cape') flowers. The leaves are a glossy green and grow to 5 cm long. 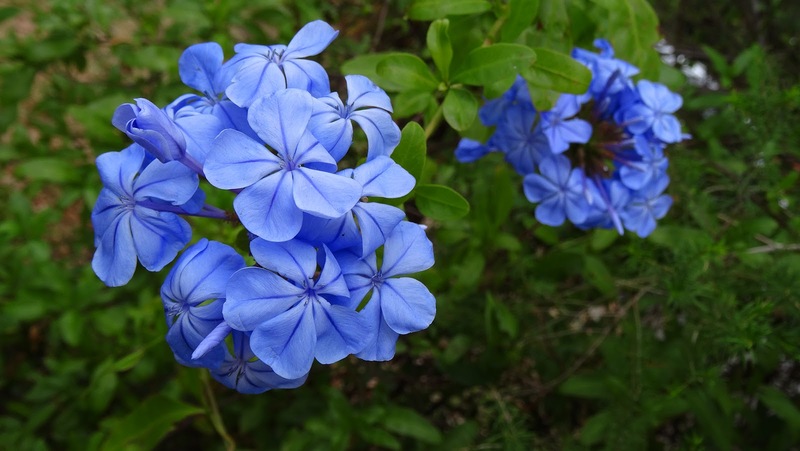 Plumbago grow best in full sun to part shade.The specific epithet auriculata means "with ears", referring to the shape of the leaves. In temperate regions it may be grown outside in frost free areas, otherwise under glass. The species and the white-flowered form P. auriculata f. alba have both gained the Royal Horticultural Society's Award of Garden Merit. A popular house plant, Streptocarpus, is an Afrotropical genus of flowering plants in the family Gesneriaceae (the Gesneriads). The genus is native to Afromontane biotopes from central, eastern and southern Africa, including Madagascar. The flowers are five-petalled, salverform tubes, almost orchid-like in appearance, and hover or arch over the plant. In the wild, species can be found growing on shaded rocky hillsides or cliffs, on the ground, in rock crevices, and almost anywhere the seed can germinate and grow. For the home, there are now many hybrids of various colours and forms available. The genus is defined by having a spirally twisted fruit (from Greek via Latin, where strepto = twisted, carpus = fruit - Greek: Στρεπτόκαρπος), although this character is also found in some other Old World genera of Gesneriaceae. Although generally referred to simply as "Streptocarpus", or "Streps", the common name for subgenus Streptocarpus is "Cape Primrose", referring to the nativity of several species to South Africa and their superficial resemblance to the genus Primula. The common name for subgenus Streptocarpella is "Nodding Violet". There are a few odd Asian species of Streptocarpus that however do not belong in the genus. Molecular systematics has shown conclusively that they are not true Streptocarpus and should be placed in another genus. 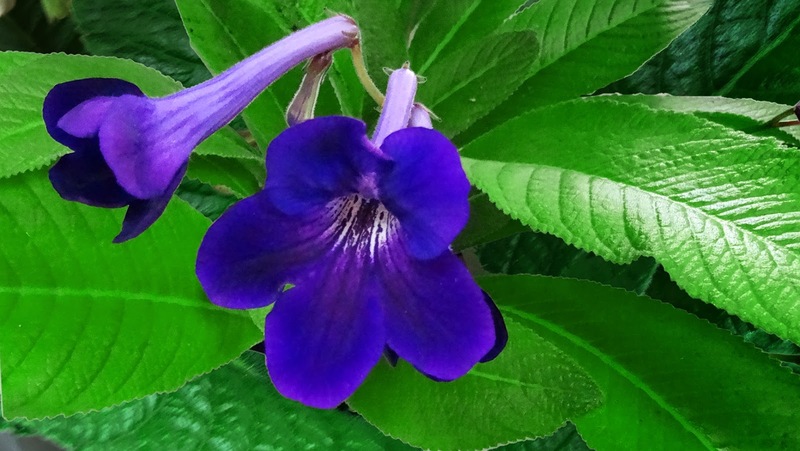 DNA studies have shown that, despite not having a twisted fruit, the genus Saintpaulia (African Violets) evolved from within the Tanzanian Streptocarpus subgenus Streptocarpella. This particular hybrid with the striking dark blue flowers is "Anderson's Crows' Wings". Hydrangea (common names hydrangea or hortensia) is a genus of 70-75 species of flowering plants native to southern and eastern Asia (China, Japan, Korea, the Himalayas, and Indonesia) and the Americas. By far the greatest species diversity is in eastern Asia, notably China, Japan, and Korea. Most are shrubs 1 to 3 meters tall, but some are small trees, and others lianas reaching up to 30 m (98 ft) by climbing up trees. They can be either deciduous or evergreen, though the widely cultivated temperate species are all deciduous. Having been introduced to the Azores, H. macrophylla is now very common, particularly on Faial, which is known as the "blue island" due to the vast number of hydrangeas present on the island. Species in the related genus Schizophragma, also in Hydrangeaceae, are also often known as hydrangeas. Schizophragma hydrangeoides and Hydrangea petiolaris are both commonly known as climbing hydrangeas. There are two flower arrangements in hydrangeas. Mophead flowers are large round flowerheads resembling pom-poms or, as the name implies, the head of a mop. In contrast, lacecap flowers (shown here) bear round, flat flowerheads with a centre core of subdued, fertile flowers surrounded by outer rings of showy, sterile flowers. The flowers of some rhododendrons can appear similar to those of some hydrangeas, but Rhododendron (including azaleas) is in a different order. In most species the flowers are white, but in some species (notably H. macrophylla), can be blue, red, pink, light purple, or dark purple. In these species the colour is affected by soil pH. 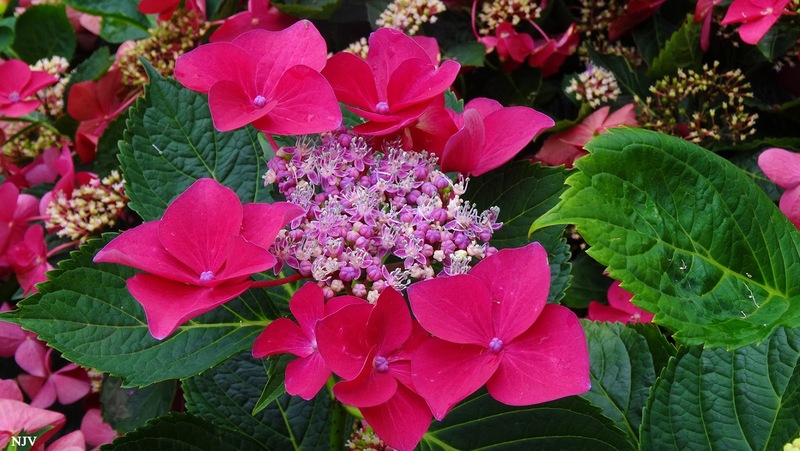 For H. macrophylla and H. serrata cultivars, the flower colour can be determined by the relative acidity of the soil: An acidic soil (pH below 6) will usually produce flower colour closer to blue, whereas an alkaline soil (pH above 6) will produce flowers more pink. 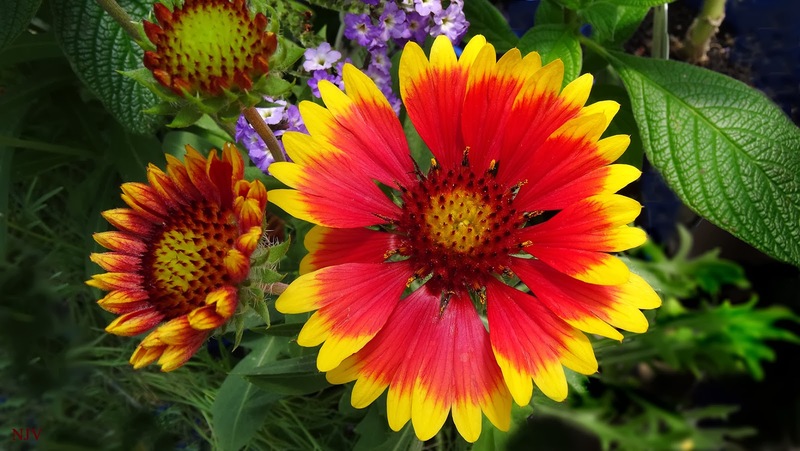 This is caused by a colour change of the flower pigments in the presence of aluminium ions which can be taken up into hyperaccumulating plants. Mandevilla is a genus of plants belonging to the dogbane family, Apocynaceae. It consists of about 100 species, mostly tropical and subtropical flowering vines. 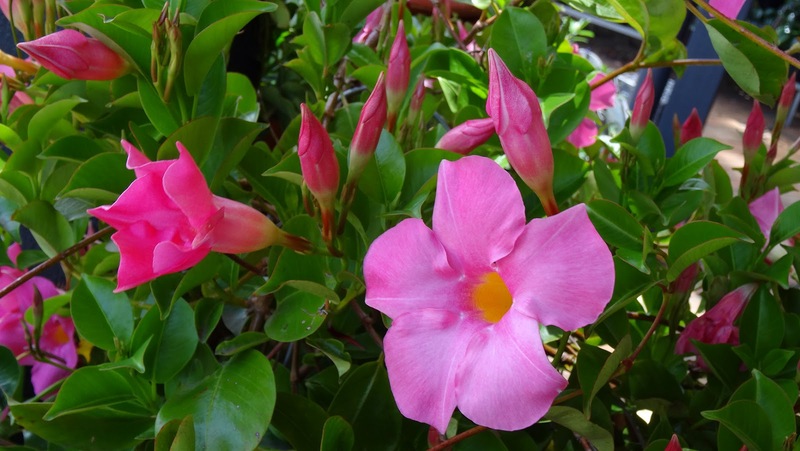 Mandevilla species are native the Southwestern United States, Mexico, Central America and South America. Many originate from the Serra dos Órgãos forests in Rio de Janeiro, Brazil. The genus was named after Henry Mandeville (1773-1861), a British diplomat and gardener. The Aloha Mandevilla series are versatile climbing plants that boast prolific flowering in the warmer months and offer a great choice of excellent flower colours. We’re also proud to say they’re bred right here in Australia. The range takes you through a voyage from the darkest red to the brightest pink and white. Mandevilla originated in the tropical climate of Brazil, however, successive breeding with the well-mannered Dipladenia-type plants by Australians Mal Morgan and Graham Brown has seen them become adaptable to Australia’s climatic conditions. The Alohas are climbing plants but they’re not aggressive. If they aren’t given the chance to grow onto supports, they remain shrub-like and flower from top to bottom. If planting in pots or tubs, give them a frame to grow onto for best results.